Russian Ka-52K combat helicopters are to combat-test the new Hermes anti-tank guided missiles in Syria. According to military experts, this missile provides a fire-and-forget capability – it tracks and engages the target autonomously, even if the enemy is out of sight of the helicopter crew. Ka-52K attack helicopters deployed on the Admiral Kuznetsov aircraft carrier will test-fire test the latest Hermes extreme-range anti-tank guided missiles for the first time in Syria in the battle with Islamic State, the daily newspaper Izvestiya has reported. 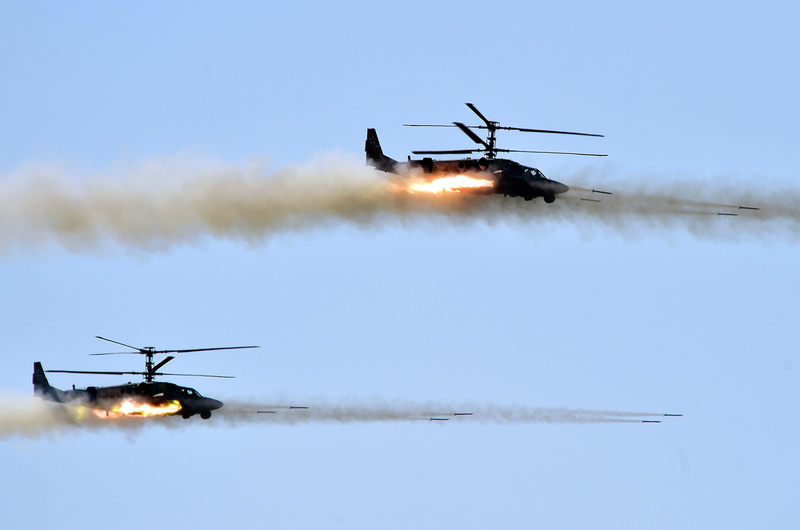 "Tests in a combat environment will help finalize the missile system, which should become a standard weapon for Russia's Alligator military helicopters," the newspaper said, citing a source in the Russian military-industrial complex. "It was decided to test the Hermes in more difficult, shipborne air operations." What is the Hermes and what is it for? According to Izvestiya, owing to the new weapon, the Ka-52K will be able to destroy enemy tanks, fortifications and manpower at a distance of 30 km (20 miles). The range of similar Russian and foreign systems (Ataka, Vikhr, Hellfire, and others) is less than 10 km. According to Viktor Litovkin, a retired colonel and military expert for the TASS news agency, the Hermes will be used to attack well-protected militant targets – arms and IED production facilities as well as command posts and temporary firing points. "Based on its combat use, it will be decided whether to send the system back for revision or to adopt it," said Litovkin. As experts interviewed by RBTH noted, the missile's key feature is the ability to track and destroy over-the-horizon targets. Due to its infrared homing and laser guidance capabilities, it can hit enemy armored vehicles autonomously, even if they are out of sight of the helicopter crew. "Similar tactical tasks can be performed by Israel's Spike-NLOS system, which is mounted on a wheeled chassis. However, Russia's Hermes can be deployed on ground tracked vehicles as well as on helicopters and ships. Ours is more universal," a source in the Russian Defense Ministry said in an interview with RBTH. According to the source, the official data on the missile will be provided after its adoption. "Now we can only say that its range is much greater than that of foreign anti-tank systems, the farthest of which hits targets 10 km away," said the RBTH source. He added that the missile can be equipped with either a cumulative or high-explosive warhead. The Ka-52 Katran attack helicopters were created for the French Mistral-class amphibious assault ships. However, according to Vadim Kozyulina, a professor of the Academy of Military Science, Francois Hollande had to terminate the contract for the supply of the ships to Russia under pressure from NATO allies. Eventually, the Mistrals were acquired by Egypt, and immediately thereafter Cairo purchased a batch of 50 Russian Katrans from Moscow. It was decided to deploy the remaining helicopters on the Admiral Kuznetsov aircraft carrier, and they will have their "baptism of fire" at the end of the year. As Kozyulina noted, the "ground" version of the Ka-52 has proved to be successful in the Syrian campaign. The new machines will also have to demonstrate their combat potential to future buyers. The helicopters can use P-73 and Igla-V air-to-air missiles, unguided air-to-surface missiles and Hermes anti-tank guided missiles.